In almost all of the travels, accommodation is one of the most important thing to consider next to your transportation tickets. In out of the country travels, it is a must to book for an accommodation ahead prior to flying. Some immigration officers would check it and your return tickets to make sure that you are going back and not staying there for employment, most specially if you are there for a tour. We were booked at Mini Hotel Causeway Bay Hong Kong. As a first timer in Hong Kong, you will surely be overwhelmed with how huge the airport is, and not researching where to go ahead will surely give you a heart attack. 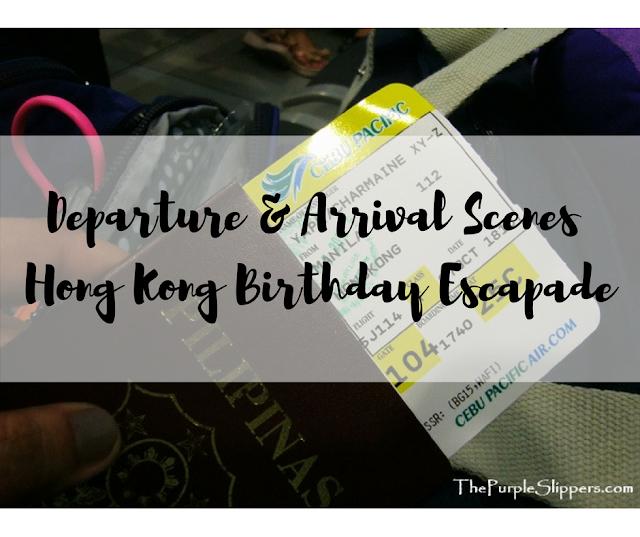 hehehe So here are departure , arrival scenes and to do's the moment you arrive at the Hong Kong International Airport. We arrived Hong Kong via Cebu Pacific Air. You might want to check the things to do when traveling outside the country. Arrive at the airport at least 5 hours before your trip. Yes I'm serious. Pay for the TRAVEL TAX at the designated collecting stations. 1 per person. If you are traveling in a group, one person can pay it all for you to avoid long queues. Check-in at the designated check-in counters, present your passport and travel tax receipt, to get your boarding pass. During the flight, the flight attendants will be giving your ARRIVAL Cards. Fill in the needed information and clip it in your passport. Once your out of the plane, look for the immigration counter at the arrival area. Ready with you the same things you have during departure except for the travel tax receipt. Also bring with your the completely filled out ARRIVAL CARD. Present the passport and arrival card to the immigration officer. Head to the baggage carousel to get your checked-in baggage. And yes... welcome to HONG KONG! This is where you will buy your AIRPORT EXPRESS tickets and OCTOPUS CARDS. From HKG Airport you have the option to take a bus, a train or a cab(taxi) to your hotel. My girls chose the AIRPORT EXPRESS (train) since we arrived quiet late in the evening and we are too tired to take the bus. Hong Kong Tourism Board, Go grab some city maps or download an app in your smartphone. Airport Express cost 100HKD one way. There are FREE Shuttle bus that will bring you to your hotel or nearest to your hotel. Make sure to choose the right shuttle. Hong Kong is a tourist friendly country, signage everywhere are translated in English for non Cantonese/Mandarin speaking tourists. By the way, before leaving the airport purchase your OCTOPUS CARD. It's an e-link reloadable card that you will use in all your transportation or food purchases in Hong Kong. It's pretty convenient. If you don't have this card, you'll have to pay exact amounts in buses, mini-bus or purchase single trip tickets. In buses or mini-bus they don't give out change, so it has to be exact amount or you'll have to pay extra if you don't have enough coins. Signages. Don't worry there are English translations below this. Airport Express FREE Shuttle routes. We took H2. We took H2 and stop at the Regal Hong Kong Hotel and walk our way towards our accommodation. Our hotel is 2 blocks away from the main hotel drop off point. We walked our way to our hotel. Unlike in the Philippines where you can request for a door to door drop off (which I find ridiculous sometimes) in Hong Kong if your destination is quiet away from the drop off point, you need to walk your way for you to save some cash. Taxi's are expensive hehe. And after a few minutes, we are here. Welcome to MINI HOTEL Causeway Bay. I'll tell you more about this hotel, in my next post. Hope you find this helpful. Please do share it to your friends.